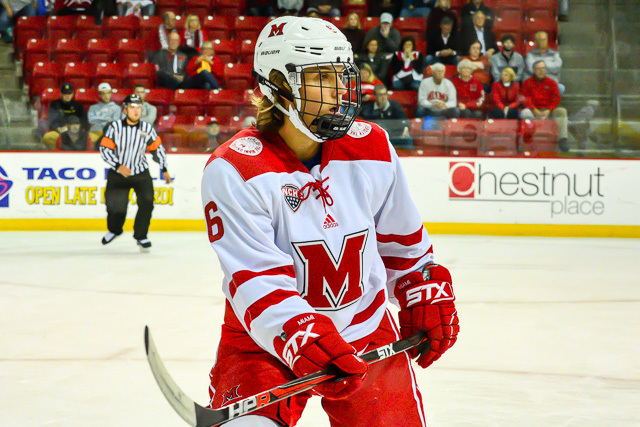 OXFORD, Ohio – Before coming to Miami, hockey opportunities were scarce for Grant Hutton. No team in the USHL wanted him, and college offers were nearly non-existent. Hutton dishes out a hit against Providence (photo by Cathy Lachmann/BoB). Hutton is from Carmel, Ind., the Indianapolis suburb that produced former RedHawk Cameron Schilling – who has played 10 games in the NHL – as well as current Miami forward Scott Corbett. Hutton’s father, G.R. Hutton, logged a season with USHL Omaha and G.R.’s father also coached hockey. So as soon as Grant learned how to walk, his family threw him on skates. After two seasons with the Indiana Ice Under-16 team, Hutton hoped to make the Ice’s USHL team, which had drafted him. He was excited about the prospect of playing for the team he watched growing up less than a half hour from his home. Hutton didn’t ultimately stick with the Ice, as he dressed just four games with Indiana that season and spent the majority of the campaign with NAHL Corpus Christi, which had tendered him. “It was just one of those deals where obviously I wanted to be in the USHL but I was still young and wasn’t quite there yet,” Hutton said. Prior to the following season, Hutton, now 18, attended the camps of two USHL teams – Des Moines and Tri-City. So that fall it was back to Corpus Christi. In parts of two seasons there, Hutton scored 10 goals and assisted on 19 others in 85 games. At the trade deadline, Tri-City – one of the USHL teams that snubbed him the previous off-season – traded for him and called him up. In 20 games there he went 1-1-2. He returned to Tri-City for his final juniors season in 2014-15 but that team again cut Hutton as it was in a rebuilding process. Then Des Moines – the other USHL team that had released Hutton – traded for his rights and he logged 11 games there. Des Moines again told Hutton that things weren’t working out, and it was back to the NAHL. Hutton joined Janesville, but unlike some of his previous stops, this one would prove fulfilling. With current teammate Zach LaValle leading the team in points, Hutton racked up four goals and 10 assists in 32 games, going a remarkable plus-26 in just half a season. His plus-minus was largely the effect of Janesville’s 49-11 regular season record, as the Jets advanced to the conference final that spring. So a season that started with Hutton yet again being rejected by the USHL ended up being one of his best on-ice developmental experiences. In three seasons of juniors, Hutton played for five teams in two leagues and was cut five times, with two teams releasing him twice. His struggle to find a USHL suitor is baffling considering he has missed three games in three seasons since coming to Oxford. Hutton as a freshman (photo by Cathy Lachmann/BoB). With three years of juniors service, Hutton, now 20, had only three Division I teams interested in him. Air Force was one but Hutton hadn’t considered that route, and Bentley wanted his services but he would have to walk on there. Though the RedHawks courted Hutton, there was certainly no guarantee ice time would be available for him entering his freshman year. The 2015-16 RedHawks featured five senior defensemen plus sophomores Louie Belpedio and Scott Dornbrock. Hutton was the lone freshman on D, and he fully expected to sit most of his Division I rookie season. But when the defensive pairings were announced for Game 1 of 2015-16, Hutton’s name was on the lineup sheet, and he earned an assist in his inaugural NCAA game vs. Providence. Hutton played in 35 of 36 games his first season, and with all of the veterans already on the Miami blueline he was able to gain experience in lower-leverage situations in adapting to the college game. Hutton, who is third in Miami hockey history in defenseman goals, did not score once as a freshman, picking up five assists. He earned NCHC defenseman of the week honors once and blocked 38 shots. Hutton celebrates his first home goal vs. Maine his sophomore year on Oct. 21, 2016 (photo by Cathy Lachmann/BoB). With all of the departed senior blueliners, Hutton relished the opportunity to move into a more offensive-oriented role and log minutes on the power play his sophomore season. He was happy with his progress the summer before his second year, and from Game 1 the puck started finding the net. Hutton scored his first career goal in Providence on opening night 2016-17. Hutton finished that season with nine goals, tops among Miami defensemen, and he tied Belpedio for first in points by a blueliner with 17. Junior season, Hutton racked up five goals the first four games of the season. He ended up leading all college hockey defensemen with 13 goals, and he added 14 assists. Hutton celebrates one of his two goals at Bowling Green junior year on Nov. 24, 2017 (photo by Cathy Lachmann/BoB). It was the fourth-most goals ever by a Miami blueliner. “It’s no coincidence that he shoots extra pucks every day and then they end up in the back of the net, but he puts in the work to get what he deserves,” junior forward Gordie Green said. Green joined the team after Hutton’s freshman season, so he doesn’t know life at Oxford without Hutton being a major scoring threat. “I kind of joke with him: The Grant that I know wasn’t the Grant Hutton his freshman year,” Green said. Immediately following 2017-18, both RedHawks assistants and six non-seniors left, and the pro game was beckoning the undrafted star. Hutton said he pondered the decision during a family trip, and he and Josh Melnick – also a highly-skilled senior-to-be with pro aspirations – publicly announced via social media that they would return for their senior season. Hutton and Josh Melnick on Senior Weekend vs. Western Michigan (photo by Cathy Lachmann/BoB). Both Hutton and Melnick were assistant captains last season and they were named co-captains prior to 2018-19. As captain, Hutton has seven goals and 13 assists this season, leading the team in blueliner goals. His 20 points rank fourth on the team. For his career, Hutton has 29 goals, the third-most ever in Miami history among blueliners behind only Kevin Beaton and Dan Boyle. He also has 41 assists for 70 points, the fourth-highest defenseman total in the Cady Arena era. Matthew Caito, Chris Wideman and Belpedio are the only others to record more in their RedHawks careers since the rink opened. “He has grown so much as a player since we’ve gotten here,” Melnick said. Both Green and Melnick talked about the advantage of having Hutton on the ice during their shifts. “From a forward perspective, if you’re working hard in the corner you know you can get the puck up to him at the point and you’d better go to the net because you know it’s coming,” Melnick said. Hutton said he was recently talking to his father, G.R., about the magnitude of his four-year transformation from unwanted to Miami captain. And when the RedHawks’ season ends, NHL teams will be drooling to sign a player of Hutton’s caliber, with a stature and skill set custom made for the pro game. But if it wasn’t for Miami, that evolution may have never occurred, and Hutton has treasured his years in Oxford. 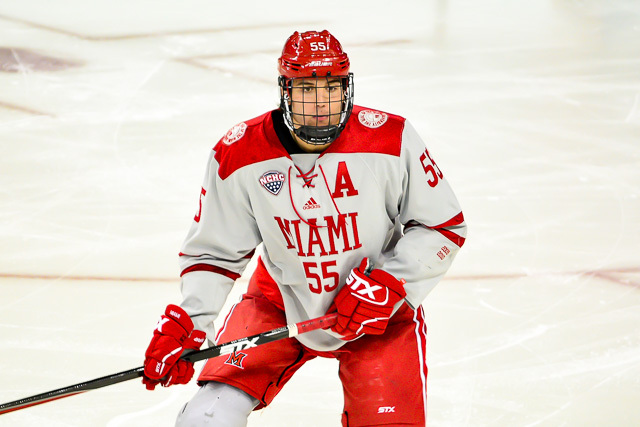 OXFORD, Ohio – No one in the history of Miami hockey can match Josh Melnick’s clutch goal resume. The NCAA still uses 5-on-5 overtimes, so scoring is relatively rare in those five-minute frames. But Melnick has netted three OT winners in his career plus two more in 3-on-3s following the extra sessions. Melnick was born and grew up in Annandale, New Jersey, about 50 miles west of New York City. He fell in love with hockey thanks to his step-father, David Crandall. Melnick played prep hockey as well as soccer and lacrosse at Delbarton, a private New Jersey high school that was close enough for him to live at home. He eventually dropped the other two sports and was dominant on the ice his final two years of preps. His junior season he scored 22 goals and picked up 25 assists in 28 games, and he racked up 62 points including 46 helpers in 26 contests as a senior. The following season, Melnick, 18 at this point, headed to Youngstown of the USHL. His first season there he posted a 7-21-28 line in 52 games. In 2012-13, he returned to the Phantom and his numbers ballooned. He notched 14 goals and a league-leading 48 assists in 60 games, including a five-point performance that included a hat trick vs. Fargo. Melnick had intended to play Division I hockey for Princeton but decommitted within the final month of his final juniors season. Within weeks Melnick had committed to Miami following a visit to Oxford. “I fell in love with the campus right away, and everything that the program stands for,” Melnick said. He also would be joining former Youngstown teammates, which he said factored into the decision, as he was close friends with Kiefer Sherwood, and Conor Lemirande and Grant Valentine also played with Youngstown during Melnick’s juniors career. Josh Melnick scores the first 3-on-3 overtime goal in NCAA history on this shot (photo by Cathy Lachmann/BoB). Melnick adapted to the college game with ease. He assisted on Miami’s first goal of 2015-16 and scored in that inaugural NCAA game as well, Oct. 9, 2015 vs. Providence at Cady Arena for a two-point night. “We had a lot of seniors on our team my freshman year and I think that was huge, just getting guidance from them on a daily basis and being able to play with some of those guys right off the start was really good in terms of learning what it takes at this level,” Melnick said. The next night he would become the first player in Division I history to score a 3-on-3 goal following the conclusion of overtime. College hockey had allowed conferences the option to adopt that format for league points the previous off-season. Though PC was not in Miami’s conference, the teams skated three a side anyway following what was officially a 2-2 tie, and Melnick lit the lamp. 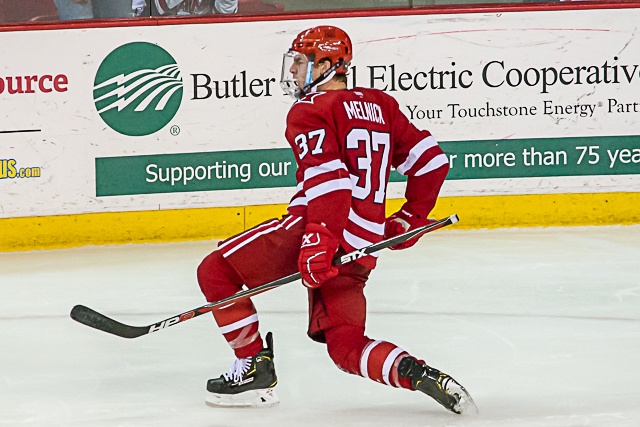 Two months into his sophomore season, Melnick found the net in overtime to beat Colorado College for his first official OT winner, and he did it in spectacular fashion. Teammate Carson Meyer threw a wrister at the net, and it grazed off the side of Melnick, who batted it out the air and into the short side of the net. Two games later, Melnick tallied the tying goal in the final minute vs. St. Cloud State. Then he scored the game winner in overtime. Early in his junior season, he victimized Colorado College in OT again, this time burying a rebound on a loose puck at the top of the crease. He added another 3-on-3 goal to earn Miami a conference point earlier this season vs. St. Cloud State on Dec. 1. That gives Melnick three official overtime winners plus two 3-on-3s in supplemental OT, and he has six official career game winners. Over 15 percent of his career goals have gone in the GWG column. Melnick scores in overtime to beat St. Cloud State on Jan. 6, 2017 (photo by Cathy Lachmann/BoB). Some perspective: No Miamian has ever even scored two career overtime winners since Cady Arena opened in 2006-07. 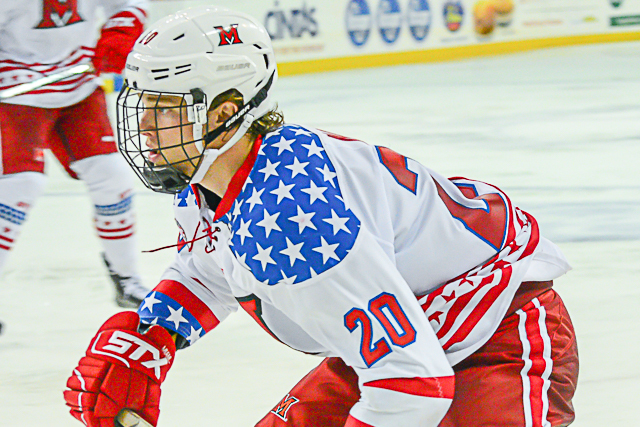 — Melnick is the only RedHawk with multiple OT goals in a season since at least 2000. 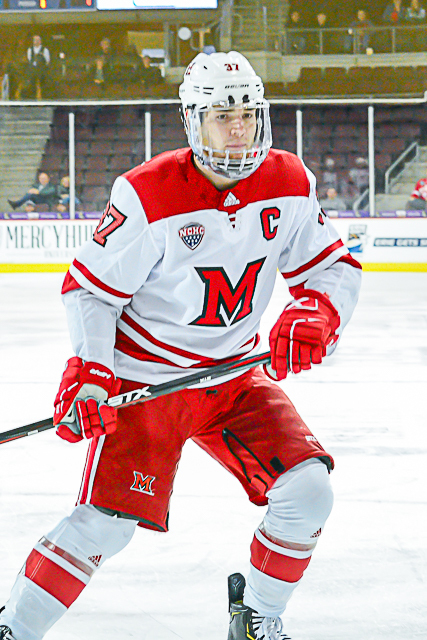 — The last Miamian to post two career OTWs in a career was Alec Martinez, whose first won the final game played at Goggin Arena, clinching the RedHawks’ CCHA opening-round tournament series. — Chris Michael is the last Miamian to score an OT winner in consecutive seasons, doing so in 2003-04 and 2004-05. Freshman season he was voted the team’s rookie of the year by his classmates and was a finalist for Miami’s most valuable player award. Named assistant captain as a sophomore, his points total jumped by two each of the next two seasons. Junior Gordie Green has been his linemate for much of those campaigns. Green notched 21 points as a freshman but vaulted to a team-best 15 goals and 33 points last season. In 2018-19 Green is again tops on Miami in goals with 11 and is second in points by just one. The team leader is Melnick, who is also second on the RedHawks in markers with 10. This season his points rate is at a career high, as he averages exactly a point a game with 26 in 26 contests. He missed six games with an upper body injury. Melnick’s game winner vs. Colorado College on Nov. 3, 2017 (photo by Cathy Lachmann/BoB). So in addition to his reputation for scoring in the clutch, Melnick has exemplified consistency in the points column. His season totals are 25-27-29-26. That’s a total of 107 points, tied for the 45th with Blake Coleman on the all-time RedHawks’ leaderboard. As impressive as his offensive numbers are, Melnick has been one of the top defensive forwards on the team each season. In addition to playing against opponents’ top forwards, he logs as much ice time on the penalty kill as any RedHawk. Miami has even played four forwards with him in a defense slot late in games this season. After last season, there was uncertainty as to whether Melnick would have the opportunity to eclipse the 100-point mark. With both assistant coaches and six non-seniors leaving the program, it was unclear if Melnick would return for his senior year. But early in the off-season, he and Hutton told the world via social media they would both be back for their final year. And his game has further evolved this season, as he has improved drastically in the faceoff circle. He has been resilient in his quest to improve his faceoff numbers, as he has been one of the last players off the ice during practice because of his work in the circle. He has won 55 percent of his draws in 2018-19. A faceoff win by Melnick directly led to a Miami goal last weekend. The RedHawks went 0-6 earlier this season while Melnick was out. 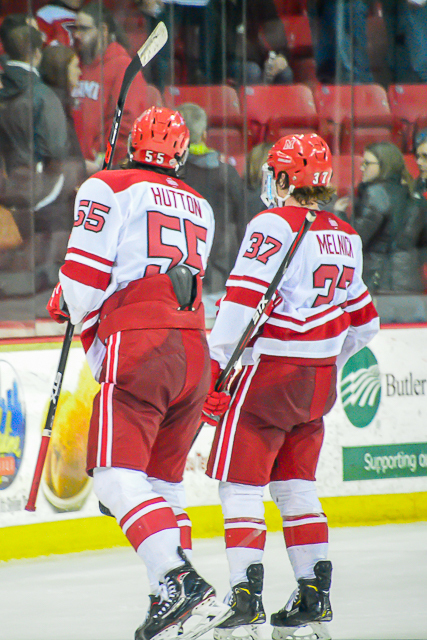 Melnick and Hutton were named co-captains this season, a fairly unusual move in hockey but one that has worked well for program. 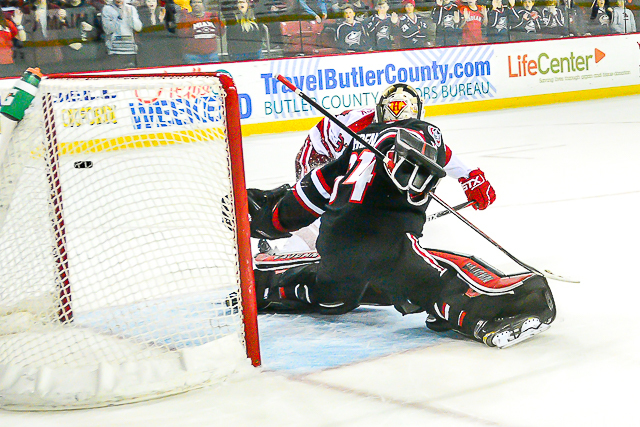 Melnick scores this goal in a 3-on-3 on Dec. 1, 2018 to earn an extra point for the RedHawks (photo by Cathy Lachmann/BoB). “I think the relationship is very solid, and so anytime you do something like that the two guys have to get along, and have to kind of share the load,” Blasi said. Hutton has been more vocal while Melnick has played a more lead-by-example role, and Melnick always leads the pre-game huddle speech when the team congregates around the net. 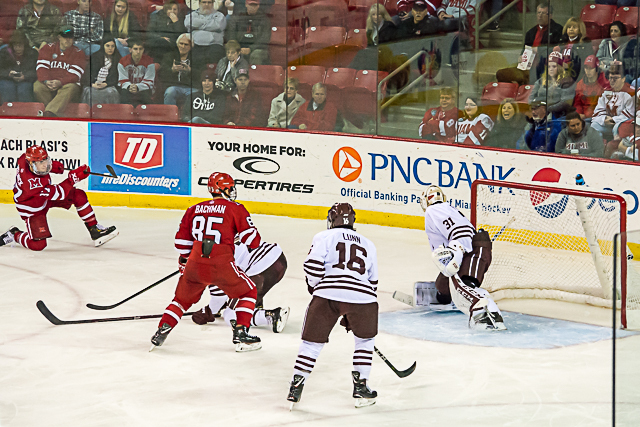 Melnick scores from a bad angle earlier this season vs. Colgate (photo by Cathy Lachmann/BoB). 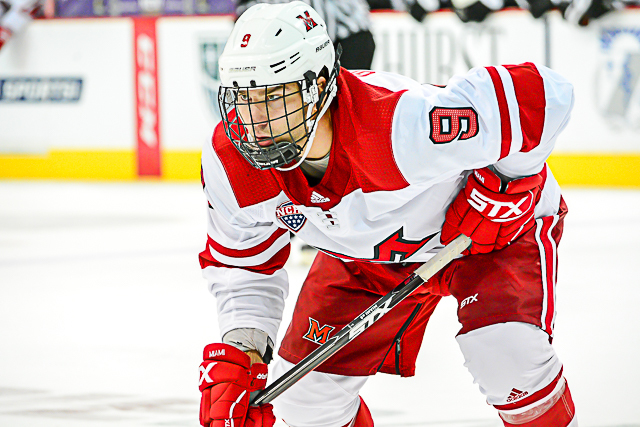 That consistent level of excellence has carried over into the classroom as well for Melnick, who is a four-time member of the NCHC All-Academic Team. And Melnick celebrates his goal vs. Colgate (photo by Cathy Lachmann/BoB). Unfortunately for Miami, Melnick’s time in Oxford is running short, as the RedHawks play their final two regular season games this weekend. 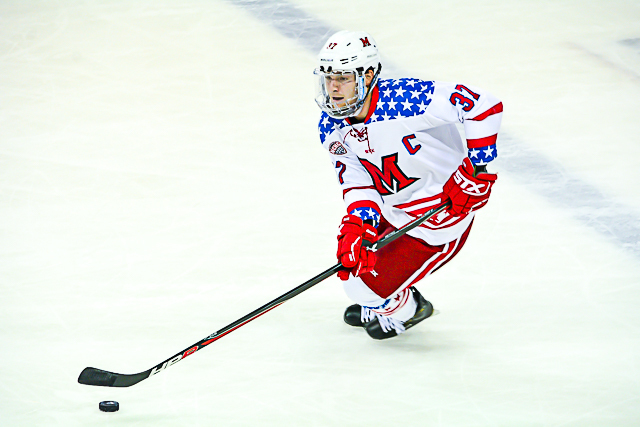 And while he said his time as Miami has gone too quickly – with each season zooming by faster – Melnick has carved a permanent legacy into RedHawks hockey history. Both teams scored five times in the first two periods. But a Kobe Roth goal with 13:17 left in regulation was the difference maker in No. 3 Minnesota-Duluth’s 6-5 win over Miami on Saturday. 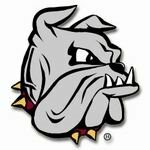 In a crazy game that saw the Bulldogs score twice in the first 90 seconds and ultimately fall behind by a goal in the second period, UMD (21-9-2) completed a four-game season series sweep of the RedHawks. MU dropped its third straight game and is 0-11-2 in its last 13 games on the Bulldogs’ home ice. RECAP: Just 86 seconds into the game, the Bulldogs led by two thanks to a pair of Nick Wolff goals scored on outside shots, 23 seconds apart. Miami’s Jonathan Gruden (photo by Cathy Lachmann/BoB). Miami (11-19-4) went on a two-man advantage and powered home a pair of quick goals of their own, tying it on markers scored 55 second apart. Josh Melnick whipped a wrister home from the high slot on the 5-on-3, and Jonathan Gruden grabbed a rebound off a Grant Hutton shot and backhanded it home to tie the score at the 5:42 mark of the opening stanza. Riley Tufte tipped home a slap pass from the edge of the crease on the power play to give Minnesota-Duluth a 3-2 lead with 10:30 left in the first frame. The RedHawks again answered with a man-advantage goal of their own, as Hutton ripped a shot from the high inside edge of the faceoff circle that found its mark with 3:34 left in the first period. A blue line blast by Dylan Samberg put UMD ahead by one again, 4-3 less than three minutes into the middle stanza, but Gordie Green tied it for Miami with a one-timer from the slot off a centering feed by Ryan Siroky along the boards. RedHawks forward Carter Johnson stole the puck behind the Bulldogs’ net, wrapped around and poked it into the net less than two minutes later to give the RedHawks their only lead. But with 20 seconds left in the second period, Parker Mackay cleaned up a rebound off a blue line wrist shot by Scott Perunovich to tie the score at five. The game winner also was scored on a rebound, as Roth banged home a Billy Exell shot from the side of the net 6:43 into the third period. STATS: Hutton finished with a goal and two assists, tying his career high in points. It was his fourth-ever three-point game. — Melnick and Green both found the net and picked up a helper. Green snapped a five-game goalless streak and Melnick recorded his third tally in five games. With 107 career points, Melnick moved into a tie with Blake Coleman for 45th on Miami’s all-time leaderboard. — Gruden broke out of a 12-game skid without a marker, and Johnson scored for the first time since opening night. — The RedHawks were 3-for-5 on the power play, scoring three times on the man advantage for the first time since Jan. 12, 2018 in an 11-7 loss at Omaha. Miami also gave up two PPGs on four chances. MU is 15 of 24 on the penalty kill in its last eight games, a clip of 62.5 percent. — The RedHawks generated just 19 shots and have failed to put up more than 22 shots in five consecutive contests. They have been outshot by 94 in that span, or 19 shots per game. THOUGHTS: Miami played much better overall than on Friday, especially considering the RedHawks went down two within the first 90 seconds. MU was assisted by a 5-on-3 later in the first period, as the team scored twice to tie it. The RedHawks actually led heading into the final minute of the second period but ultimately two Minnesota-Duluth rebound goals in the final stanza were the difference. As tough as Miami has had it at Amsoil Arena, it’s looking more likely the RedHawks return there for their first-round NCHC Tournament series again. MU has gone to Duluth two of the previous three years for the best-of-3 and its season has ended there both times. — Gruden seems to be heating up at the right time. He made a highlight-reel pass to set up Phil Knies‘ goal on Friday and scored one of his own in this game. — Funny how a game with the same officials as Friday played about at an equal level physically sees these teams combine for nine power play chances after racking up only two in the series opener. Even the UMD broadcasters were commenting on that and how calls against both teams that weren’t made on Friday were minors on Saturday. Miami and UMD combined to go 6-for-11 on the man advantage for the weekend (54.5 percent). — Jordan Uhelski made the start and allowed six goals on 39 shots. It wasn’t one of his better games, and Ryan Larkin was not in top form on Friday. LINEUP CHANGES: River Rymsha was back in the lineup after serving his league-imposed one-game suspension. He replaced Noah Jordan. The only other move was Uhelski in net for Larkin. STANDINGS: At 5-15-2 in the NCHC, Miami is locked into a seven or eight seed. The RedHawks are tied with Omaha for seventh place but are technically behind the Mavericks because they lose the tiebreaker, which is goal differential in head-to-head meetings (UNO has outscored Miami, 12-11 in their four meetings). MU is six points behind sixth-place Colorado College but cannot win the tiebreaker vs. the Tigers because of a 1-3 head-to-head mark. St. Cloud State has locked up the No. 1 seed, and if the season ended today that’s where Miami would head. Minnesota-Duluth is likely to finish second, as the Bulldogs are four points ahead of Denver. One of those three teams will host Miami in two weeks. SCSU is No. 1 in the PairWise, UMD is third and Denver sixth. 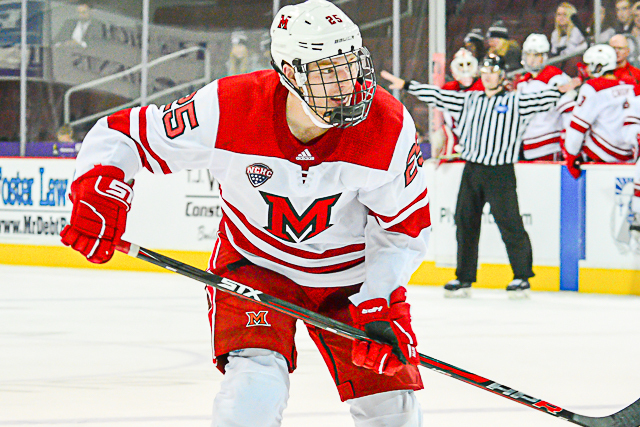 The RedHawks host Western Michigan next week while Omaha travels to North Dakota. MU is No. 34 in the PairWise. 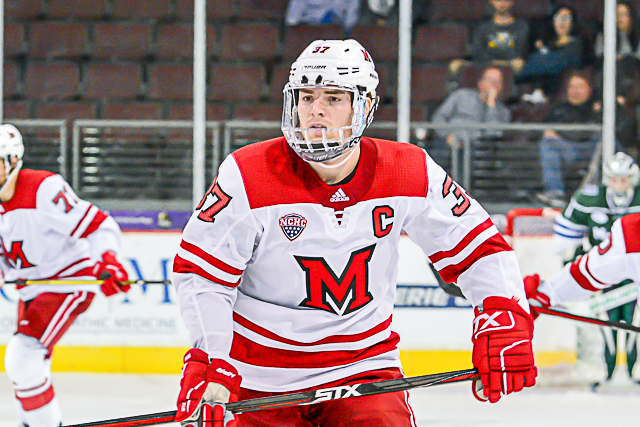 FINAL THOUGHTS: One weekend left in the regular season and all that’s left to decide is where Miami will head for the NCHC Tournament. For whatever reason the RedHawks have had more success in Denver than Duluth or St. Cloud, but Denver is also the least likely opponent for Miami, as the Pioneers would have to rally from four points down to catch UMD. However, Duluth heads to St. Cloud State next week while Denver hosts Colorado College. Miami needs a strong finish to its regular season against Western Michigan next week to carry some confidence into the postseason. OXFORD, Ohio – The longest Miami winless streak in over a quarter century is over. The RedHawks snapped a 15-game, 0-11-4 skid with a 4-2 win over Nebraska-Omaha at Cady Arena, giving MU its first win in nearly three months. Miami’s Gordie Green (photo by Cathy Lachmann/BoB). It was the second-longest victory drought in team history, with its worst — just two games longer — coming at the end of the 1990-91 season. 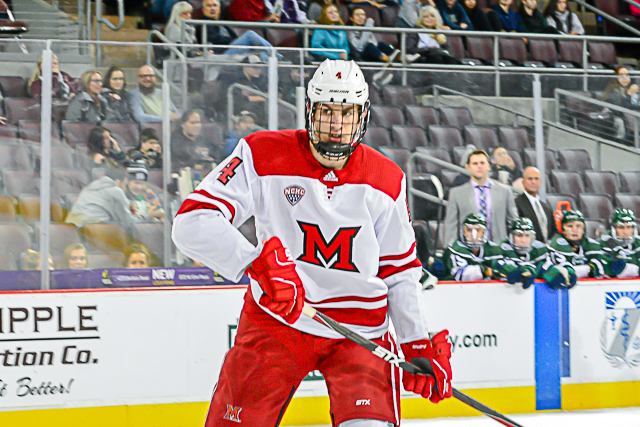 Gordie Green racked up three assists in the Miami win, and Josh Melnick and Scott Corbett finished with a goal and a helper apiece. RECAP: Miami scored first for the first time in 14 games when Josh Melnick kicked a pass to himself and swept a short pass to Derek Daschke at the faceoff dot for a one-timer that snuck in the short side 7:50 into the first period. Phil Knies appeared to have scored seconds later, but the initial call of good goal was waved off because it was ruled UNO goalie Evan Weninger’s helmet had been dislodged. But Knies found the net found the net again at 11:06, and this time it counted. Casey Gilling fired a shot from the high slot that Weninger couldn’t handle, and Knies poked the loose puck in to make it 2-0. Miami’s Scott Corbett (photo by Cathy Lachmann/BoB). Knies had stolen the puck at the blue line, shielded the defense and dropped a pass to Gilling to set up his goal. The RedHawks went up three when Green sent a cross-ice pass to Corbett, who trapped it with his skate and beat Weninger short side from the top of the faceoff circle midway through the second period. The Mavericks cut the lead to one on a 2-on-1 goal by Chayse Primeau and a blue line blast by Jalen Schulz later that frame. But Miami sealed it with just under four minutes left in regulation, as Green fed Melnick on a 3-on-2 for a rip from the center of the faceoff circle that snuck under the crossbar. STATS: It was the second career three-assist game for Green, with the other coming earlier this season against Colgate on Oct. 27. Miami’s Andrew Sinard (photo by Cathy Lachmann/BoB). – Corbett recorded his first career multi-point game, and it was the first for Melnick since Miami’s last win, which came on Nov. 17 at Colorado College. – Andrew Sinard, whose outlet pass to Green resulted in Corbett’s eventual game winner, earned an assist for his first career point. – Daschke is now tied with Grant Hutton for the team lead in defenseman goals with six, and Knies snapped a 13-game scoring drought. THOUGHTS: What a relief for Miami. In terms of standings, this win does little to help the RedHawks except increase the odds they don’t finish last in the NCHC. But psychologically it had to do wonders. The third period was the most entertaining frame MU had played in a while, with a high pace of play, plenty of physicality and tons of quality scoring chances for both teams with the score still close. Miami will need the boost, as the remainder of its schedule is brutal, with all but two of its regular and postseason games almost certainly away from Cady Arena. Not to take away from this sorely-needed win, but it’s fair to point out that Omaha is seventh in the eight-team league, and it took all Miami had just to split with the Mavericks in Oxford. The RedHawks will need to play much, much better against much, much better teams, or they will be done by or on St. Patrick’s Day once again. – Miami did not have a single healthy scratch in this game, as it had just 19 skaters and two goalies available. Bray Crowder, who was hurt on Friday, did not dress for the first time this season, leaving the team with 13 healthy forwards and six defensemen. Fortunately for the RedHawks, they have a bye next weekend, giving their banged-up players additional time to heal. – Not sure about the timing of the season ticket renewal offers. There was an announcement and accompanying note on the end zone monitors offering incentives and potential prizes for renewing this weekend. As in now, as in over a month before this season ends. One could smell the desperation in the air, and as of game time Saturday, apparently only a handful jumped on the early offer. FORWARDS: B-. The three goals by this corps were great, but they are still taking too many risks and getting out of position too often. For example, three times in the second period forwards played chicken with UNO skaters that had the puck, trying to strip them while they were on collision course to gain momentum the other way, and none succeeded. Miami wasn’t scored on during any of those occasions but each time the skater was taken out of position. That’s not smart hockey, especially with the lead. Only 15 total shots by 13 forwards against a team that allows 35 per game. Green was outstanding and was named first star but Knies was BoB’s choice, as he was all over the ice all night. Melnick and Corbett were also standouts, and Christian Mohs had good legs and gave the team much-needed energy. DEFENSEMEN: B-. A pretty average game defensively by this group, and Daschke’s laser of a goal boosts its grade into the ‘B’ range. Grant Hutton was solid on D, but it’s rare he is held without a shot. GOALTENDING: A-. Larkin turned 31 shots aside, including a 2-on-1 that he sprawled across the crease to kick out and multiple other stops on high-percentage chances. The second UNO goal was a shot from the blue line he probably should’ve stopped, but overall he was excellent. LINEUP CHANGES: Just one: Noah Jordan dressed in place of the injured Crowder. Coach Enrico Blasi has tended to go with seven defensemen this season, but he has no choice with just six healthy. STANDINGS: With the split, Miami remained two points behind seventh-place Omaha and is three points back of sixth-place Colorado College. Denver holds that all-important fourth spot and is 10 up on the RedHawks with three games in hand. After all of Saturday’s games, Miami is No. 38 in the PairWise rankings. FINAL THOUGHTS: So this series split comes heading into an off-week before a pair of tough road series. Will the time off be helpful at this point or will that kill any momentum the RedHawks may have gained from this win? Considering the locker room has been essentially converted to a triage unit the week off will probably benefit Miami more than it hurts. The pressure that the RedHawks – players as well as coaches – had to be under during their 0-11-4 had to be enormous. This win will hopefully have a cathartic effect. With Miami almost certainly pigeon holed into one of the lower seeds heading into the NCHC Tournament, it’s still all about getting better heading into that all-important best-of-3 postseason series. 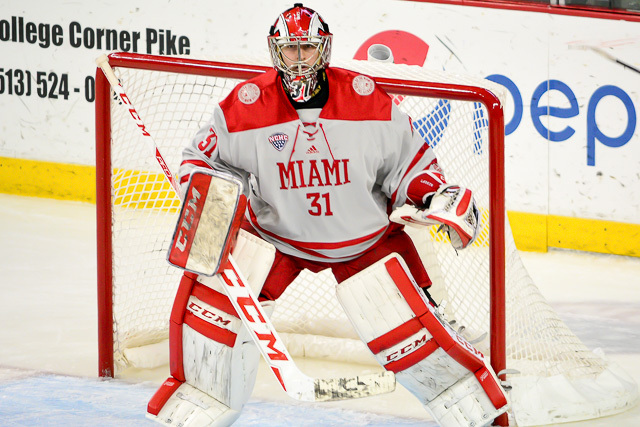 For two periods, Miami remained competitive with the top-ranked team in Division I on the road. The RedHawks were down just one goal after 40 minutes, but No. 1 St. 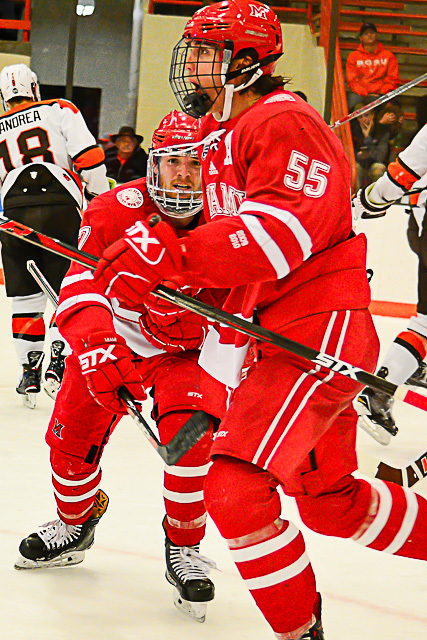 Cloud State ran off three straight markers in the final frame to seal Miami’s 5-1 loss at the Herb Brooks Center on Friday. 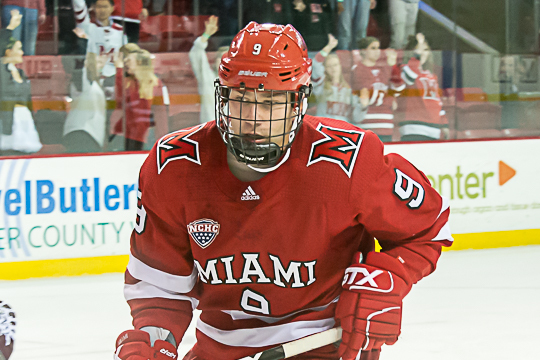 Miami defenseman Grant Hutton (photo by Cathy Lachmann/BoB). 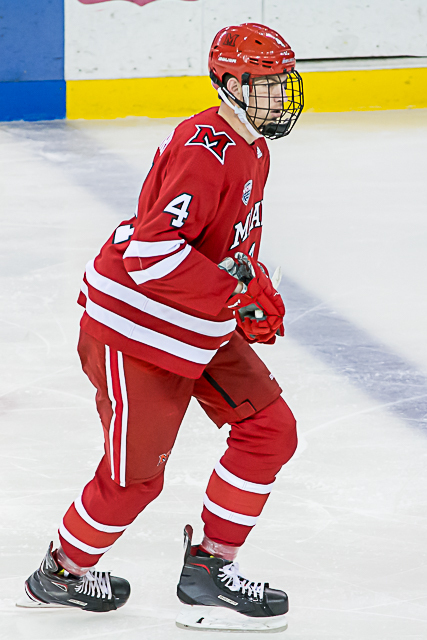 Ryan Poehling, the Montréal Canadiens’ first-round pick in 2017, scored twice and added a pair of assists for the Huskies. Grant Hutton netted the lone goal for Miami, which lost its seventh straight game and extended its winless streak to 13 (0-9-4). RECAP: Just 38 seconds in the game, Jack Poehling slammed home a one-time feed from brother Ryan Poehling on a 2-on-1 to give St. Cloud State (19-4-2) the early lead. Miami (9-14-4) appeared to have tied it midway through the period when Gordie Green stuffed a wraparound just inside the post, but it was ruled no goal on the ice and no conclusive angle showed the puck completely across the goal line. The RedHawks legitimately evened the score when Hutton wound up at the top of the faceoff circle, pump faked and aimed a modified slap shot into the far corner of the net at the 2:22 mark of the second period. But just 53 seconds later, the Huskies went ahead for good when Jimmy Schuldt ripped a one-timer inside the near post from the blue line on the power play. Ryan Poehling made it 3-1 four minutes in the final stanza, as he played give-and-go with Blake Lizotte, who sent a return pass through the crease where it was shoveled into the back of the net by Poehling. Ryan Poehling extended the Huskies’ lead to three when he skated through the Miami defense, went in alone and beat RedHawks goalie Jordan Uhelski glove side with 12:15 remaining in regulation. Patrick Newell capped off the scoring with a turnaround wrister from the faceoff dot that hit off the inside of the far crossbar 1:16 to play. STATS: Hutton’s goal was his second in three games. That moved him into third place unofficially on Miami’s all-time defenseman scorers list with 28 goals. — Green snapped a string of five games without a point, as he picked up the primary assist. — Josh Melnick, returning after a six-game injury absence, earned the secondary helper, giving him points in eight straight contests in which he has dressed. It was career point No. 101 for Melnick, who tied Pat Leahy and Mitch Ganzak for 50th on the RedHawks’ career leaderboard. THOUGHTS: Despite allowing a goal 38 seconds into the game, Miami played pretty well for 40 minutes, but St. Cloud State dominated the third. The Huskies led for all but 91 seconds – the first 38 and 53 between Hutton’s goal and SCSU’s eventual game winner. Defensively, the RedHawks have been sloppier lately, which has compounded the other woes that have culminated in this 2½-month winless streak. St. Cloud State may be the most skilled all-around teams in Division I, and in the final 20 minutes the Huskies played like it. — Green’s non-goal is tough for Miami, but there really wasn’t a definitive camera angle showing the puck completely across the line. One suspects that the puck was completely on white ice at the furthest point goalie David Hrenak extended his glove, but that isn’t proof. Had it initially been ruled a goal it almost certainly wouldn’t have been disallowed, so the call on the ice was going to the be final one either way. Things like that seem to happen to struggling teams. At least Green picked up a point on Hutton’s goal. — Melnick’s return was a blessing, as he did not appear any worse for wear due to his lower-body injury. Hopefully Miami’s offense will be rejuvenated with him healthy. LINEUP CHANGES: Scott Corbett was scratched for the second time this season, and Brian Hawkinson sat for the first time in his career. Melnick took one of those forward spots, and Zach LaValle dressed in the other after not dressing last Saturday. It was Uhelski in net, making his fourth start in six games. He has played in six straight, relieving Ryan Larkin in both of his starts in that span. FINAL THOUGHTS: The game was closer than the final score indicated, but a great college hockey team played great hockey and pulled away from a lesser squad. Not much more to be said about this one. It’s an unforgiving league, and one of the things BoB said was paramount to a solid Miami second half was not letting a losing streak snowball, and that’s exactly what has happened to the RedHawks since the start of 2019. No set of euphemisms can shield the obvious: Minnesota-Duluth has owned Miami the past few seasons. The Bulldogs are 11-1-1 vs. the RedHawks since the start of the 2016 calendar year and 15-4-2 vs. MU overall. If there’s good news for Miami it’s that the lone win during its current drought vs. UMD came on home ice last season. And the RedHawks have defended their home rink well this season, going 6-2-2 at Cady Arena. WHO: No. 5 Minnesota-Duluth Bulldogs (12-6-2) at Miami RedHawks (9-9-4). WHERE: Cady Arena (3,642), Oxford, Ohio. WHEN: Friday – 7:35 p.m.; Saturday – 7:05 p.m.
UMD RADIO: KDAL-AM (610), Duluth, Minn.
MIAMI RADIO: WKBV-AM (1490), Richmond, Ind. NOTES: Duluth is one of the best defensive teams in Division I. The Bulldogs allow very few shots, and the overwhelming majority of those are snagged by goalie Hunter Shepard. Minnesota-Duluth is tops in the conference in goals allowed (41) and seventh in the NCAA defensively at 2.05 goals against per game. Opponents average just 23.0 shots, and the Bulldogs’ defense corps consists of five sophomores and a junior with another junior between the pipes. Second-round pick Scott Perunovich leads all defensemen in points (18) and the entire team in assists (16). Blueliners Nick Wolff, the lone junior in this corps, and Kings draftee Mikey Anderson also have offensive ability, as Wolff is 2-7-9 with 62 penalty minutes, and Anderson has scored three times. Jets second-round pick Dylan Samberg, Louis Roehl and Matt Anderson round out Minnesota-Duluth’s top six on defense. Shepard led the Bulldogs to the national championship last season by allowing just five goals in four NCAA Tournament contests. He posted a 1.91 goals-against average in 2017-18 and is at 1.92 this season. Shepard’s GAA is eighth-best in college hockey and he has a save percentage of .916. He has played all but 16 minutes in net for Minnesota-Duluth this season. Up front, Justin Richards’ emergence has been a major storyline for the Bulldogs. He leads the team with 12 assists and 19 points, and he has also scored seven times, including a pair of game winners. The sophomore had zero goals in 44 games last season and finished with nine helpers. Parker Mackay is team captain and one of the top two-way players in the conference. He has a Bulldogs-best eight goals plus eight assists for 16 points. Only three other UMD forwards have 10 or more points. Senior Peter Krieger is 2-12-14, Wild draft pick Nick Swaney has six goals and six assists, and Tampa Bay selection Cole Koepke has a pair of markers and eight helpers. Minnesota-Duluth has two more NHL draft picks among its forwards. Riley Tuftes was Dallas’ first-round choice in 2016, and Noah Cates was taken by Philadelphia in 2017. They have identical 5-3-8 lines. The Bulldogs are the top penalty killing team in Division I at 92.0 percent, as they have surrendered just six power play goals. This weekend series is the front half of a four-game homestand for Miami, which is mired in an eight-game winless streak. 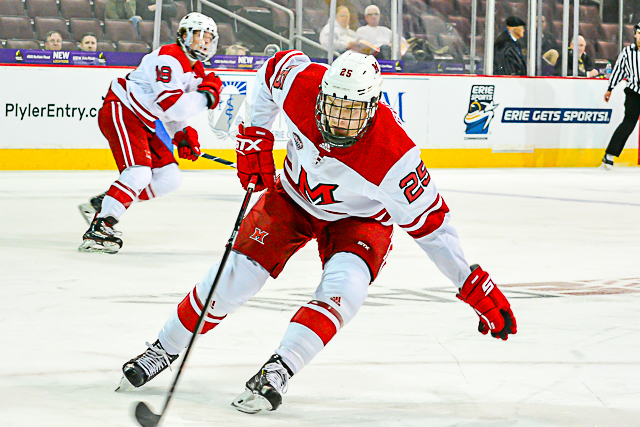 With their record at .500 for the first time this season, the RedHawks need to start winning games if they hope to earn home ice in the NCHC Tournament and eventually qualify for the national championship tournament. Gordie Green is starting to heat up, which is great news for Miami, as he has scored three goals in three games. Miami’s Josh Melnick (photo by Cathy Lachmann/BoB). Grant Hutton has four points in four games and Brian Hawkinson recorded points in both contests last weekend. Co-captain Josh Melnick missed both games last weekend with a lower body injury, and there’s no certainty he will play in this series. Goalie Ryan Larkin did not play the finale in Kalamazoo last week but is expected to play against UMD. Miami’s special teams were not very special on Friday. No. 14 Western Michigan scored twice on the power play. No. 20 Miami had zero goals on the man-advantage despite a five-minute 5-on-4 at the beginning of the third period. Those tallies were the difference as the Broncos edged the RedHawks, 4-3 at Lawson Arena in a weekend series opener. Miami extended its winless streak to seven games (0-3-4) while WMU is now unbeaten in its last nine. Josh Melnick missed just the second game of his RedHawks career. He was out with an apparent lower body injury. RECAP: The Broncos’ Colt Conrad penetrated from the point and wristed one from the slot into the far corner of the net on the power play to open the scoring 10:27 into the first period. Miami (9-8-4) tied it 91 seconds later when Gordie Green and Karch Bachman played give-and-go entering the offensive zone, and Bachman threaded a pass to Green at the side of the net for a tap-in. WMU (12-6-1) jumped ahead again when Ethen Frank fielded a pass through the slot on his backhand, pivoted and threw it in at 1:36 of the second period. Frank set up Hugh McGing off a break with 4:12 remaining in the middle stanza. Miami deficit to one when Bachman slid a pass from along the end boards to Green, who shoveled it home, making it 3-2 with 12:15 left in regulation. Passolt put WMU back up by two with his second goal of the night on a 4-on-3 with 8:17 remaining. Just 82 seconds later, the RedHawks’ Scott Corbett stole the puck in the corner and centered to Brian Hawkinson, who capped off the scoring. STATS: Green scored twice and has three goals in two games. He went through a nine-game stretch without finding the net prior to that, so his rejuvenated scoring is welcome for Miami. Bachman also finished with two points, both on assists. It was his first career multi-assist game. — Grant Hutton had gone eight consecutive games without a point but he picked up a helper and has at least one in three straight, going 0-4-4. — Miami was on the power play for 7:39 but generated just three shots. — MU won just 21 of 69 faceoffs (30.4 percent). — The RedHawks have allowed 12 power play goals in their last eight games and are just 63.6 percent on the penalty kill in that span. — Opponents have scored against MU in 10 straight periods. — Melnick missed his only other game on Oct. 29, 2016. THOUGHTS: It’s always a learning experience when Miami plays on national TV and Dave Starman does color. Miami’s Alec Mahalak (photo by Cathy Lachmann/BoB). The CBS College Sports analyst said that Miami defenseman Alec Mahalak will win conference player of the year one day. Mahalak did play one of his better games of the season on Friday. — Starman was very complementary of a number of RedHawks players, including Bray Crowder, Carter Johnson and Derek Daschke. — Starman also spoke highly of these programs’ futures, saying “the best days were ahead” for both Miami and Western Michigan. — Bachman’s speed once again resulted in a goal, as he won the race to his self-pass along the boards and eventually spooned one to Green for the marker. — What a play by Corbett to set up Hawkinson’s goal. He stole the puck in seemingly in one motion thrust the puck to the edge of the crease where Hawkinson buried it. — Yes, Melnick is one of Miami’s better faceoff men, but 21-48 in the circle? Really? Overall the RedHawks have been much better on draws than in recent seasons. — The penalty kill has been brutal. On Thanksgiving, MU was 84.5 percent on the PK for the season. That number has plummeted to 76.5 since. Miami has allowed 10 power play goals in six games while scoring just four PPGs in that stretch. LINEUP CHANGES: Melnick was the only player not in the lineup from Saturday’s game against Providence, and Johnson dressed in his place after sitting the last two. He played on the line with Bachman and Green. FINAL THOUGHTS: Another one that falls into the “near miss” category, Miami hurt itself with three offensive zone penalties (good catch, Starman) and finished 4-for-6 overall shorthanded. It’s really tough to win on the road when you give a team six power plays including a 4-on-3. Taking the second period off didn’t help. The RedHawks were outshot, 16-4 in that frame and allowed a pair of unanswered goals that put WMU ahead for good. And yes, Melnick’s unexpected absence hurt Miami in multiple areas, but the Broncos were without one of their best as well in Wade Allison. As has often been the case recently, the RedHawks were right there all night and didn’t give up. But they didn’t quite do enough to win. Of course Josh Melnick’s 100th career point was going to come on a crucial goal. Melnick’s feed to Gordie Green for a one-timer resulted in the tying goal with 42 seconds left in regulation in a 3-3 tie at Providence on Saturday. The assist was the senior’s 65th of his career and his 12th this season, moving him into the team lead. He leads the RedHawks in points (19) and is tied with Green and Karch Bachman atop Miami’s goal leaderboard with seven. In his four years at Miami, the RedHawks have won seven games in overtime. Melnick has three of those OT winners and six career GWG overall. His points total has increased each season in Oxford. Melnick finished his freshman season with 25, jumped to 27 as a sophomore and ended 2017-18 with 29. Melnick is the 52nd member of Miami’s 100-point club, and the first to reach that threshold since Anthony Louis in 2017. Rank Player Pos. Yrs. G A Pts. 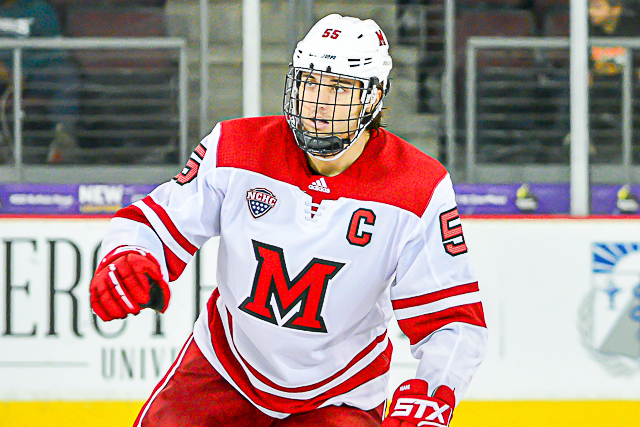 In hockey, ties tend to be regarded negatively, but considering Miami’s situation with six minutes left in regulation, the RedHawks had to be thrilled to end up in the ‘T’ column. No. 16 Miami scored twice late in the third period to salvage a 3-3 tie at No. 10 Providence’s Schneider Arena on Saturday. And the tying goal, a snipe from the slot by Gordie Green, came 6-on-5 with just 42 seconds left in regulation. Green received the one-time feed from Josh Melnick, who earned his 100th career point with the assist. Christian Mohs started the comeback by netting his first career goal with 5:21 left in regulation. RECAP: Scott Conway gave Providence (12-4-4) the lead 5:35 into the first period when he batted a blue line pass from Spenser Young into the net on the power play. The Friars extended their lead to two with another man-advantage goal, as a wrister by Ben Mirageas from just inside the blue line deflected off a Miami stick and in with 6:23 remaining in the middle stanza. The RedHawks (9-7-4) trimmed the deficit to one when Jonathan Gruden threaded a pass through a pair of defenders across the slot to a wide-open Ryan Siroky at the side of the net, and he slammed it home with 14:02 to play in regulation. That was also a power play goal, the sixth of the weekend for these teams. Miami’s Christian Mohs (photo by Cathy Lachmann/BoB). Providence answered just 13 seconds later as Miami’s Bray Crowder tried to knock the puck away from Brandon Duhaime, but it ended up on the stick of Bryan Lemos in the slot for an easy score to make it 3-1, and it appeared that would wrap up a weekend sweep for the Friars. But Mohs shot one from the top of the faceoff circle that hit a Providence sweater and found net with 5:21 left for his first career goal, and the RedHawks were again within one, 3-2. With the extra attacker on, Melnick slid a pass from the wall through traffic to a wide-open Green in the slot, and his blast sent the game to overtime. — Melnick. He’s the 52nd player in Miami history to reach 100 points, with the last being Anthony Louis in 2017. He also extended his points streak to seven games, notching three goals and five assists in that span. That’s the longest stretch of consecutive games with at least one point by a Miamian this season. — Siroky. He finished with a goal and an assist, setting three personal milestones. 1) It was the senior’s first career multi-point game, 2) it was the first time he had ever scored goals in consecutive contests, and 3) he is riding his first-ever three-game points streak, during which he is 2-2-4. — Grant Hutton. Hutton picked up two assists, giving him three points for the weekend. He had not notched a point in his previous eight games. — Mohs. It was his first career goal, although he did create a nice build-up by scoring in the exhibition vs. Guelph last Sunday. — Green. He had not scored in 10 games but is still tied with Melnick and Karch Bachman for the team lead with seven markers. 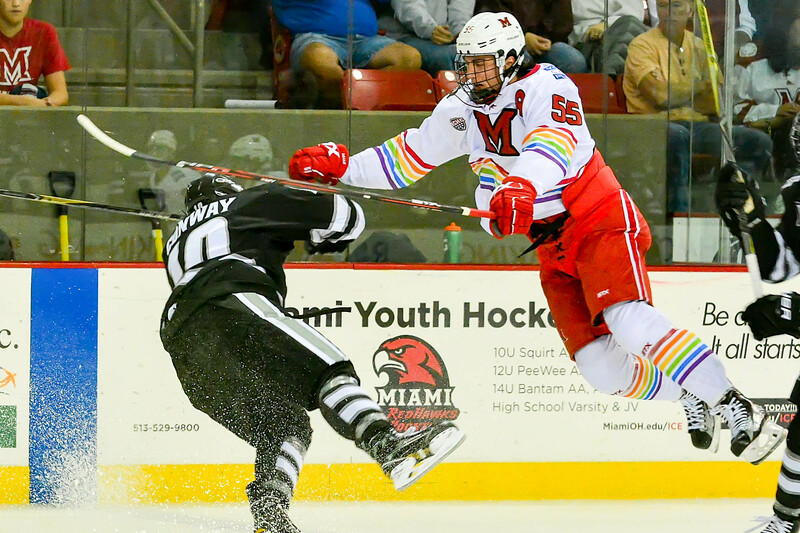 — Miami is actually winless in its last six games with an 0-4-2 record, but the RedHawks skated to draws vs. No. 1 St. Cloud State twice and adds this quality tie – if there is such a thing – to its 2018-19 resume. Miami did not have any stalemates in its first 14 games but has tied four of its last six contests. — Special teams. The good: Miami is 4-for-13 its last three games, or 30.8 percent. The bad: The RedHawks were 3 of 6 on the PK this weekend and are now just 57.1 percent dating back to the New Hampshire series. THOUGHTS: This is yet another major step for this program in the ‘reenergize’ movement, as Coach Enrico Blasi called it before the season. Though it wasn’t a win, this moved the needed significantly in the RedHawks’ desired direction. Turning a two-goal deficit at a top-10 team into a tie with six minutes remaining is a rarity and speaks to how far Miami has come this season. Flipping a team from a sub-.400 three-year winning percentage to a national contender in college sports is a long process that requires patience from coaches, student-athletes and fans. Countless hours of work by the former two and others immediately surrounding the program are starting to pay tangible dividends, with this tie coming on the back of a pair of draws vs. the top-ranked program in Division I that saw Miami trail six times on the weekend and battle back to even the score on each occasion. This is no last-place NCHC team, this is not a team deserving of zero votes in national polls. 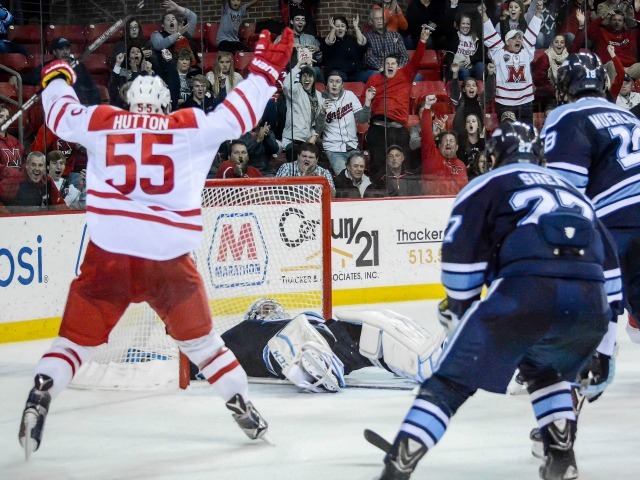 Now in the meat of their schedule, the RedHawks are proving the college hockey world wrong every night. — Miami certainly can’t blame officiating for its 0-1-1 weekend. Power plays for the weekend were 11-7 in favor of the RedHawks, with PC assessed 40 penalty minutes compared to 20 for Miami. — Despite having little room to operate against the super-tight Providence defense, wings Knies and Ben Lown seemed to pass across the width of the ice to each other at will. A healthy Knies will hopefully result in more offensive production from that line. — The cost to watch this series via the internet was $10, but it was a quality telecast. The picture was actually a little better for the internet-only feed on Friday than on Saturday, which was broadcast on NBC Sports Boston. Mike Logan is a veteran play-by-play man, extremely fair and gives excellent play descriptions. He was solo on Friday and was joined by Sonny Watrous on Saturday, a PC women’s hockey standout last decade. She is very knowledgeable about the game and the tandem work well together in the booth. Both were very complimentary of the Miami program and agreed with the officials’ calls on almost every occasion, despite the penalty disparity. — Didn’t know this, but Logan said on Friday that this is the last time these teams are scheduled to play each other for the foreseeable future. Since 2011-12, Miami and Providence have faced each other every season, typically early in the season. The only time during that span they didn’t meet in the regular season was 2014-15 when Miami was sent to the Providence bracket of the NCAA Tournament and lost, 7-5 in the first round just minutes from the PC campus. Despite the travel and the Friars’ 8-1-3 record vs. the RedHawks in the last 12 meetings, this has been a great series over the years, as Providence is always a well-coached team with tons of skill. Hopefully Miami and PC renew the all-time series at some point. LINEUP CHANGES: None. Blasi went the same 20 both nights and seems to like defenseman Andrew Sinard in that extra skater flex role. UP NEXT: Sixteen games in nine weeks, all against NCHC foes. Miami heads to Western Michigan next weekend, facing the Broncos for the first time this season. WMU is second in the conference with 14 points and is ranked No. 17 in the USCHO poll, one spot below Miami. Friday’s game will be televised nationally on CBS College Sports. Then the RedHawks play four at Cady Arena – two vs. Minnesota-Duluth and a pair against Colorado College. FINAL THOUGHTS: Miami Version 2018-19 further cemented its play-to-the-final-horn reputation, as the RedHawks have scored a tying goal in the third period in all of its recent QTs (quality ties). Remember the comeback win against UMass-Lowell and the two clutch third-period goals against North Dakota that broke a tie. One could see the RedHawks’ emotions as they gathered on the ice after the five-minute overtime, as this was certainly a bonding experience for the players. That’s the type of experience that can only help Miami as it shifts back to conference play for the balance of the regular season. Colorado College and Miami have been the two least successful teams since the formation of the NCHC, but both are on upswings and could challenge for NCAA berths next spring as well as make runs at all-important home-ice seeds for the first round of the conference tournament. The Tigers were 4-1-1 before their brutal start to the league schedule, as they dropped their first four NCHC games against St. Cloud State and Minnesota-Duluth and are still looking for their first league win of 2018-19. Meanwhile, Miami split both of its opening series in conference play and are looking to make an early move in the ultra-competitive NCHC. WHO: No. 20 Miami RedHawks (8-4) at Colorado College Tigers (4-5-1). 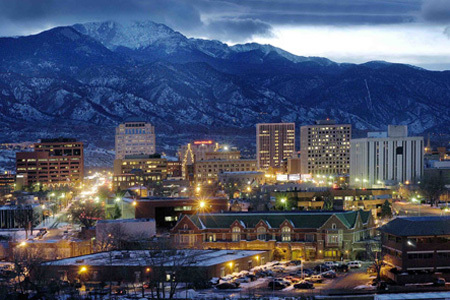 WHERE: World Arena (7,380), Colorado Springs, Colo. WHEN: Friday – 10:07 p.m.; Saturday – 8:07 p.m. ALL-TIME SERIES: Miami leads, 9-7-2. LAST SEASON HEAD-TO-HEAD: Colorado College, 2-1-1. Nov. 3 – Miami, 3-2, OT; Nov. 4 – Colorado College, 2-1; Jan. 26 – Colorado College, 6-3; Jan. 27 – Tie, 4-4. COLORADO COLLEGE RADIO: Both nights – KRDO-FM (105.5 and 92.5) and KRDO-AM (1240), Colorado Springs, Colo.
MIAMI RADIO: Both nights – WKBV-AM (1490), Richmond, Ind. TELEVISION: Friday – AT&T SportsNet Rocky Mountain (DirecTV Ch. 683, Dish Network Ch. 414). NOTES: Colorado College opened NCHC play by facing the top two teams in Division I the past two weekends — St. Cloud State and Minnesota-Duluth — and were outscored, 15-5 in four losses. The Tigers have been well balanced in their scoring early this season, with eight skaters averaging at least half a point per game. Ten forwards have recorded at least four points for Colorado College, with Nick Halloran and Trey Bradley tied for the team lead at nine. Alex Berardinelli is tops in Tigers goals with five, including two shorthanded, and Westin Michaud has scored four times and added three assists. Grant Cruikshank (2-4-6), Mason Bergh (0-5-5) and Chris Wilkie (3-2-5) round out Colorado College’s scoring leaders, although Wilkie has missed the last four games. Freshman Bryan Yoon leads the team in defenseman points with five, including one goal, and Kristian Blumenschein has four assists. Andrew Farny, Ben Israel, Zach Berzolla and Alex Pernitsky have been the other regulars on the blueline. Alex Leclerc has logged nine games in net and will likely start both games this weekend. He has a 2.62 goals-against average and .916 save percentage. Amazingly, the Tigers have had 51 power play chances compared to 29 for their opponents and have scored 10 times on the man advantage as well as three shorthanded goals. But Colorado College is just 72.4 percent on the penalty kill and has surrendered a pair of shorties. 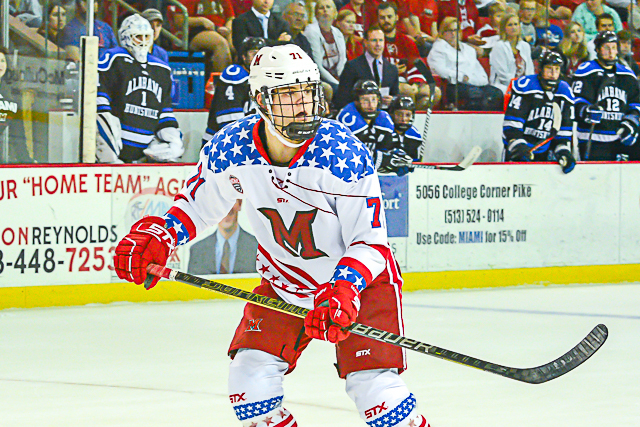 Gordie Green has led the RedHawks by tallying 10 points in his last seven games, including five goals, and Josh Melnick has notched nine points in six games. Casey Gilling is 1-4-5 in his last five. Miami is 7-for-26 (.269) on the power play the last seven games. Two trends MU would like to reverse: The RedHawks have been outshot by an average of 14 SOG the last three games and have given up five third-period goals in that span.